Week of March 26, 2017 – Color! New Pattern for Fans. I just dropped off a new quilt I made and patterned for Wooden Spools (45”x 45”). Maybe because it was still winter when I started it or maybe it was just time, but this one is out of my usual Civil War Reproduction fabrics mode (I have been comfortable here for several years). That’s not to say that I won’t go back to my wonderful browns, greens, blues and reds but this time I used the entire Color Wheel. Each block diagonal is made of complimentary colors (across the color wheel from each other) and they move one by one around the color wheel to encompass every color. I’m sorry to say the picture doesn’t do it justice. In person, it is just so bright and cheerful it makes me smile. I would love to teach a class on this if there is any interest or you can purchase the pattern from Wooden Spools for just $8.50 and make it on your own. As you might imagine there were leftovers from the Island Batik scraps so I had to make a miniature of a quilt I created years ago. The original used 2” squares and ended up at 58” x 58”. 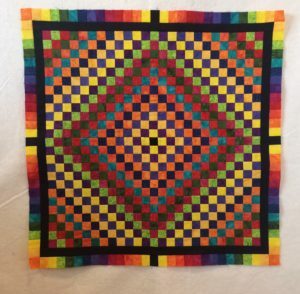 This one uses 1” squares so it is finishing up at 29” x 29”. So far, I only have the top done but I hope to get it quilted in the next week or two. I might even make up a pattern for this one. 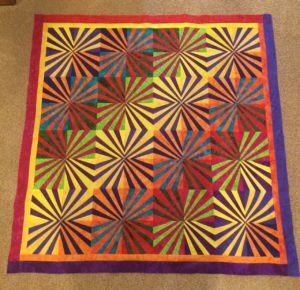 It’s another bright quilt to make you smile. I think I’ll call it “Trip Around the Color Wheel World”. Doesn’t that sound appropriate? The other day I was going through some of my International Little Quilts in my collection and came across this last one. When I purchased it (here in the US), the tag said Viet Nam – Pan Dau quilt. 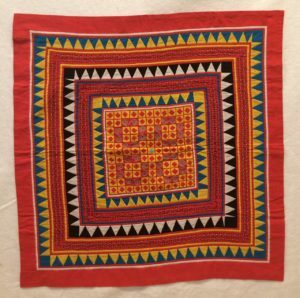 In doing a little research it looks to me as though it could even be from the Hmong people and it is often referred to as Pa Dau (No N) but either way it is just a wonderful example of exquisite hand work and a great use of color. I continue to be amazed at the talent in needle work that exists in the many parts of our world. I only hope other women (and men) draw as much joy from it as I do.